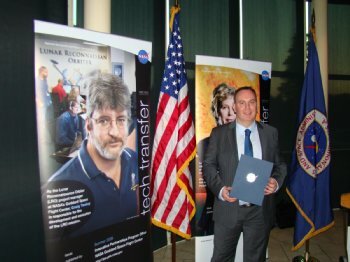 University of Ulster lecturer Roy Sterritt, after receiving a NASA Patent Application Award and a Patent plaque at the NASA Goddard Space Flight Center's New Technology Report Program ceremony in Mitchellville, Maryland. US SPACE AGENCY NASA has been granted a patent on research by University of Ulster computer scientist Roy Sterritt and is using his autonomic software engineering methods in its ground-control systems. Mr Sterritt lectures in Informatics in the School of Computing and Mathematics and is a member of the Computer Science Research Institute. His interest in space related work was triggered partly by science fiction books as a child, and epic films such as Star Wars. The Belfast man first caught NASA’s attention six years ago when senior scientists there heard him speak about concepts that even then seemed in the realms of science fiction. Now his research is helping change the face of space exploration. Using the principles of ‘autonomic computing’, which attempts to mirror elements of human physiology in technology, he has investigated ways of making the next generation of space craft self-managing, instead of mission-control having to guide them at practically every turn. Current thinking among space scientists foresees a future in which swarms of small craft will replace single-craft missions. He and NASA scientist Mike Hinchey collaborated to devise programs that could make small robotic craft self-directing and self-controlling, and also self-destructing if their autonomous behaviour were to threaten the safety or technical aims of the mission. Each received a NASA Patent Application Award and a Patent plaque at the prestigious annual NASA Goddard Space Flight Center's New Technology Report Program ceremony in Mitchellville, Maryland, last week. US authorities have granted NASA two patents on the men’s work so far, and more are in the pipeline.